Experiential learning activities deliver positive impacts for students, businesses and local economies. Participating in experiential learning offers real-life, first-hand experience, and exposure to fields and industries, which helps students develop a wide range of skills and work habits needed to be successful. Experiential learning has been found to support higher school retention, graduation, and postsecondary participation rates, as well as boosting academic achievement, positive attitude, and preparation for careers. For employers, offering experiential learning provides an early opportunity to engage Ontario’s future workforce and raise awareness about career options. 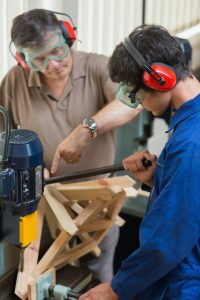 Experiential learning activities are a cost-effective alternative for recruiting, training and retaining young workers. Experiential learning provides professional development opportunities for existing employees to build leadership, mentoring, and communication skills. Finally, experiential learning may help address pressing labour market issues, including Ontario’s rapidly aging workforce and the ever-increasing demand for workers with higher levels of education, skills and experience. …an approach to student learning that provides students with opportunities to participate actively in experiences connected to a community outside of school (local, national, or global); reflect on those experiences to derive meaning from them; and apply their learning to their decisions and actions in various aspects of their lives.